World Travel on a motorcycle is a challenging test for both rider and motorcycle. As a rider, you have to be prepared to endure long days, technical obstacles, long waits at border crossings, multiple languages, foreign foods, the unknown, and much more. Each moment of each day you’re likely to face a great many unforeseen obstacles and challenges. So, it is best to prepare for your trip with rigor and enthusiasm. As I’ve mentioned, I’ve been taking part in Cross-fit for the better part of 4 months, and with each week of workouts, I feel stronger, and readier for the trip. And so I’m doing my best to get the rider ready, but what about the bike. As you can imagine, riding a bike for close to 18,000 miles, across and through some of the roughest terrain on the planet can take it’s toll on the bike. The bike will feel the stress of natural wear and tear, filling oil and air filters with dirt, wearing down tires, wearing out cables and controls, wearing out brake pads, and much more. In addition, while riding a bike in this type of terrain, there is a very high likelihood that the bike will be hit with rocks, will suffer dents and scrapes from tip-overs and/or drops, will expose wires and tubing to wear from vibration, and will have to deal with river crossings, and monsoon conditions. So, we need to outfit the bike with maximum protection, and we need to replace any parts that are not capable of withstanding this kind of abuse. So, you can see that I’ve already done just about everything that can be done to the bike, in order to keep it protected, and to get it to fit me perfectly. But, even with all of the changes that I’ve made, there was still one big potential weak spot in the structural integrity of the bike. And this is the front fork/shock. This stock device, delivered by BMW with the bike, is suitable for normal riding, but these things tend to fail when subjected to the extreme. And so, I decided to purchase the Touratech front shock, as a complement to the rear shock, which was installed 2 years ago. I’m not afraid to perform most of the maintenance and installation tasks for my bike. I’m kind of fearless in this way, and it’s this fearless (some would say irresponsible) way of taking on challenges that allows me to do most of what is necessary to maintain and modify the bike as needed. But, BMWs are complex machines, and when you’re preparing for a trip like this, it makes sense to rely on an expert. So, I ordered the shock from my local BMW dealer (Motorcycles of Charlotte), and 2 weeks later, I received a call that the part had arrived from Germany and was ready to be installed. I called the dealer and spoke to William, Michael and Paul, the entire Service management team. These guys tend to be busy over the course of the day, but I’ve gotten to know all three of them, and so in order to efficiently setup a service appointment, I’ll end up talking to whomever is available at the time. 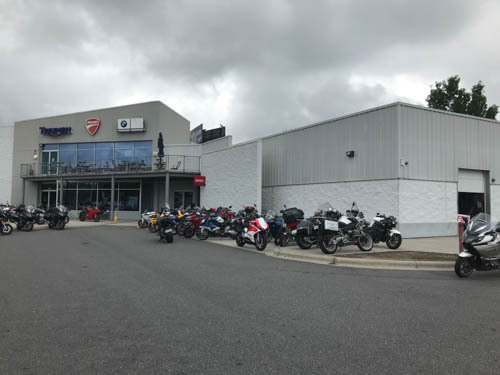 BMW of Charlotte is located in Charlotte, NC, near the intersection of Hwy 77 and Hwy 485. It’s about a 25-30 minute ride from my home in Indian Land, and while it’s only about 17 miles from home, with the traffic and suburban roads, it usually takes me 30 minutes to get there. 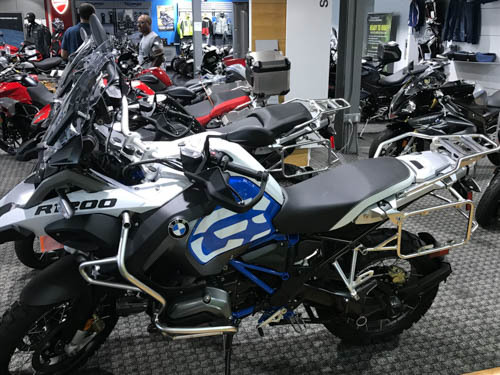 Over the last few years, this dealer has done a great job to increase sales, and they are now the biggest dealer in the area, and one of the largest on the E Coast. 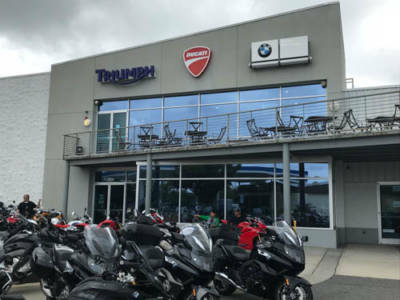 While they sell Triumph, Ducati, and BMW as their primary brands, it is BMW that they sell the most of, Of all of the BMW bikes that they sell, it is the GS and the GS Adventure that are sold most frequently. 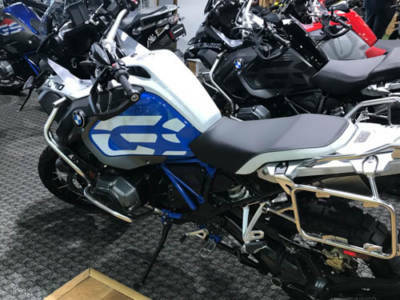 My bike is a 2015, which was the first year of the GS Adventure, within the new product launch that changed the cooling for the GS from air-cooled, to water-cooled. 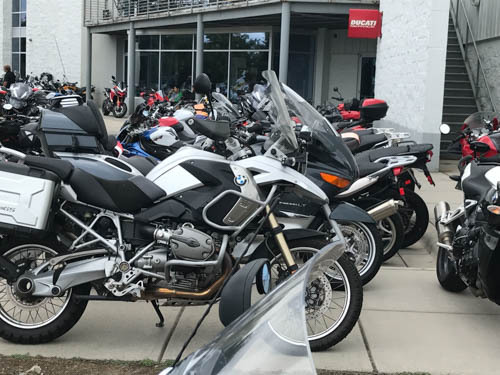 This new generation of R1200 GS is often called the R1200 GS LC (Liquid Cooled). 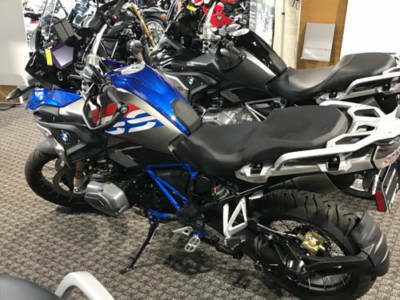 You can see below a number of the new GS and GSAs on the floor at the dealer. 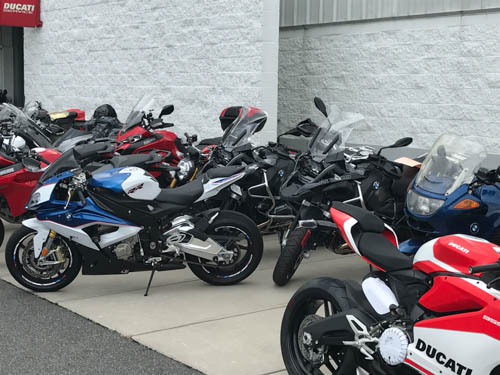 BMW has done a great job adding some more stimulating graphics, but when I purchased my bike in 2015, no such options existed. So, in my case, I removed the original decals on the bike, and replaced them with new graphics. Within 5 days of being notified that the shock had come in, I was going to leave on a 5 day trip that would take me through North Carolina, and Virginia, almost entirely on dirt roads. This route, called the Mid-Atlantic BDR starts in Damascus, VA and ends in PA, at the NY Border. I’ll only be riding the first 250 miles or so, but it’s going to be a great way to shakedown the bike. And so, I called Paul on Tuesday, and let him know that I needed the shock installed with urgency, in order that I could begin testing it in off-road conditions. After a few emails and 2 phone calls, I was all set with a 2PM appointment on Thursday, 36 hours after my initial phone call. I’m forever trying to do too much stuff in too short a period of time. And so, this service appointment was not an exception. Instead, I had scheduled the shock installation (a 2 hour job), along with replacing a relay for my Clearwater lights (a 1 hour job), and having a general look-around the bike (impossible to estimate the time for this). The net/net was that if everything went according to play, my bike would be finished sometime after 5PM, but there is always the risk that something might go wrong, and so William (the Service Rep) asked me how I would handle the situation if my bike was not done on time. With puppy dog eyes, I looked at him and said that failure was not an option, and that I did not have a backup plan. My schedule from Thursday, until Tuesday morning, the day that I was leaving for the BDR ride was virtually packed and I would not be able to get back in touch with them to finish any incomplete work. Michael and William talked, and with confidence, Michael said, don’t worry, we’ll get it done! And so, it began… I had been assigned a mechanic/technician named Clint, who is a very meticulous person indeed. In fact, he’s a man after my own heart. He examines everything he sees, and over the duration of the repair (4 hrs 30 min), he asked me about things he discovered about 4 or 5 times. As Clint took the bike apart, he found numerous little things that were not perfect, and should be corrected, especially considering my upcoming trip. 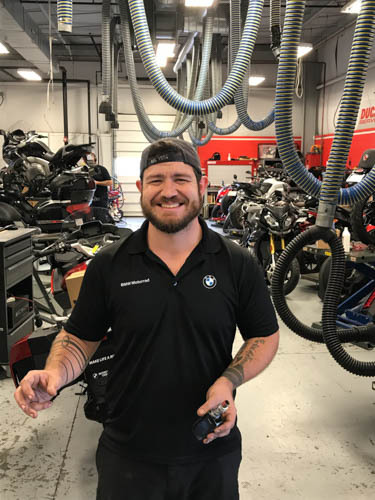 It’s a good sign if your mechanic is smiling, right? Before you can understand the replacement process, I thought I’d share a video with you that Touratech puts out, in order to describe the virtues of their shocks. So, Clint removed the Fuel Tank, most of the surrounding body kit, and got to work. Within about an hour, he had completed the installation of the front shock, and started out doing the other things I requested, and also giving the bike a thorough going-over. Over the course of about 4 hours or so, Clint meticulously went through the bike, addressing these items, and installing the shock. At around 6PM, he finished, and then spent another few minutes resolving a problem related to the wire for one of the oxygen sensors on the bike. He re-seated the connector for the sensor, and the bike was perfect, and ready for me to ride home. The ride home was uneventful, and the bike ran great. And now, as I write this, I’m getting ready to head North and ride two days of the MA-BDR. I expect the new shock to perform admirably, and to give me much better control over technical terrain. But, most of what is required to ride over technical terrain comes from the driver’s abilities, not from the bike. I know that some of these posts are relevant to friends who ride (such as you) while others are more applicable to all of my friends who are voyers, and who love to see all of the crazing things that I will do while in these remote areas. And so, I try to write that everyone will enjoy each post, even if they are less inclined to do so. In your case, its hard for me to know if you’re truly riveted, or if I’ve bored you to death. Don’t worry Nancy, I’m planning on visiting Belgium, and we’ll definitely get together for a little fun.